When we last caught up with Laurent Quenioux, he was hosting a series of pop-up dinners at Starry Kitchen, in addition to helming the stoves over at Vertical Wine Bistro in Pasadena. 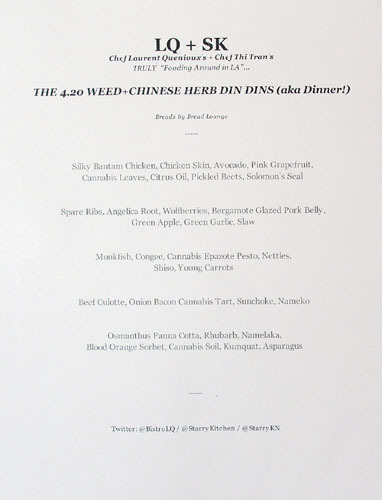 Since then, the LQ@SK run has come to an end, and to cap off that collaboration, Quenioux has teamed up with SK's Thi Tran to cook a couple of Cannabis-inspired dinners. The first took place on April 1st, with this second iteration occurring on the very appropriate date of 4/20. 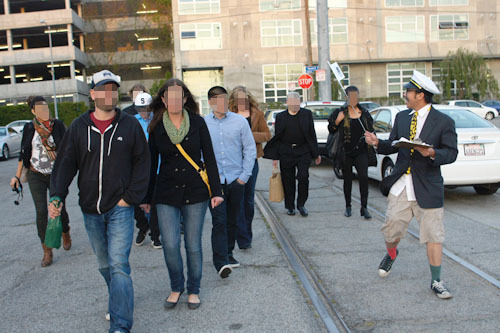 To fully engage the theatrics of it all, we were asked to meet at a random location in Downtown. "Commodore" Nguyen Tran then greeted us, checked us in, and in groups of 10, guided us on a "Lionel Richie Listening Tour." The walking tour concluded at the entrance of a non-descript building in an industrial section of the City, and we were instructed that there would be an optional, complementary dinner following. 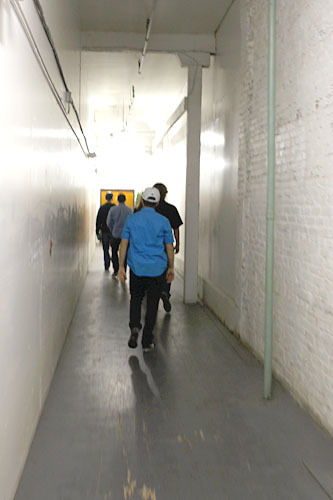 ...Until we arrived at a large room serving as a holding tank for potential diners. We were able to sneak away to the adjacent loft, where the dinner was actually being prepared. Note the lady in red: that was actually NBC's Kim Baldonado--yes, we were on the news (James Koh from FOX 11 News was there, too). Helping out tonight was Quenioux's right-hand man Daniel Vasquez, as well as ink's Klein Debow. 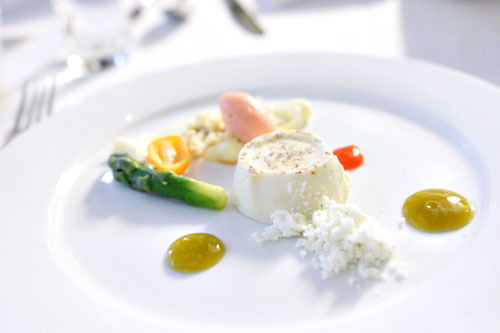 We then returned to the event space, where everyone was lining up and plating up. 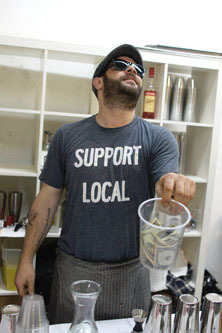 Former ink GM-slash-Beverage Director Josh Goldman (now with full beard) was manning a makeshift bar, and was also in charge of the evening's cocktail pairings. 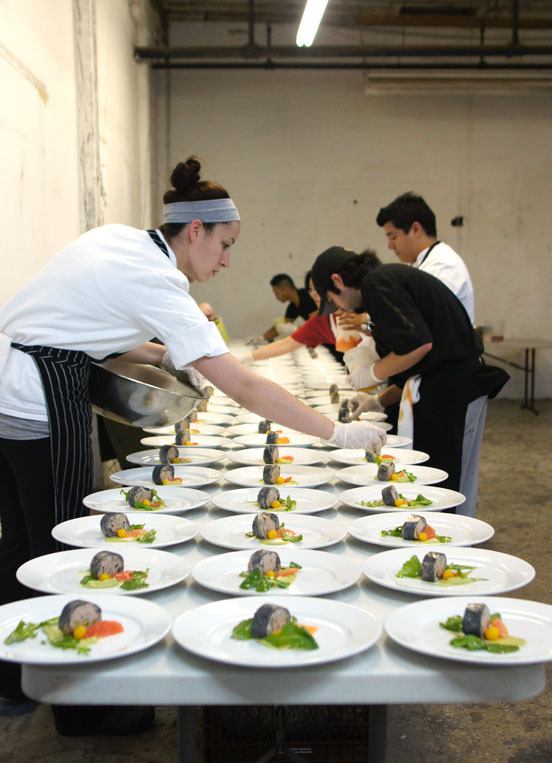 Plating dishes for 105 diners was no easy task. The dining room: we were jam-packed in there, 30 to a table--might've been some sort of fire hazard. Here we have the evening's five-course menu. Bread was advertised as being provided by local baker Bread Lounge, though curiously, none was to be seen. Click for a larger version. 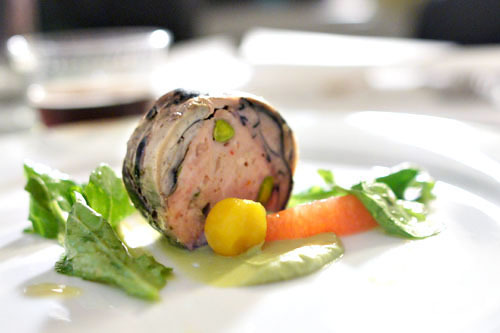 We began with what basically amounted to a roulade or galantine of silkie chicken. It was delicious--dense and hefty in body, with an immense savoriness and depth. I enjoyed the bird alone, but it was even better when paired with the lush, buttery purée of avocado. The fruit added a well-placed bit of tartness into the mix, and I also appreciated the slightly minty pricks from the herbs. A lovely start to the meal. Next up: a duo of meat. I tried the spare rib first, and loved its literally falling-off-the-bone texture and its dark, umami-laden relish, perked up by an almost medicinal tinge--excellent when taken with the cilantro as well. The pork belly, meanwhile, was also quite tasty, with a delightfully crisp crust and a good amount of fat, though some parts of mine were a touch dry. 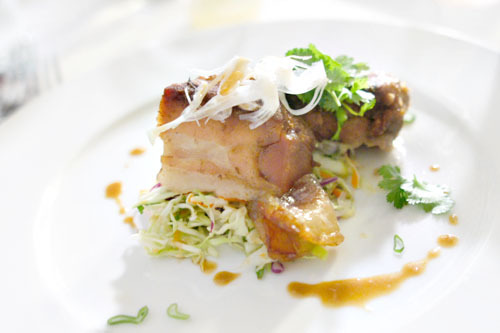 Its flavors were heady and undeniably porcine, certainly yummy alone, but also deftly tempered by the combination of apple and slaw. Pacing, unsurprisingly, was a bit slow, so one of my fellow diners, the lovely Heather Detert of American Rebel PR, took it upon herself to bust out a cookie to nibble on between courses. 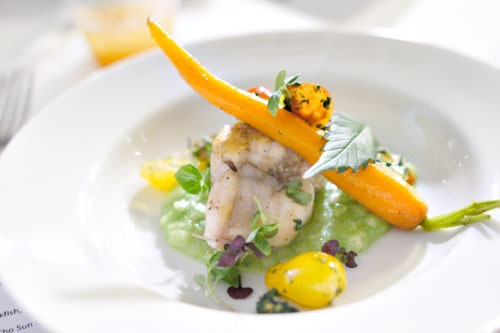 Monkfish arrived perfectly cooked, showing off a delightfully springy, spongy, supple consistency that I adored. Its flavor was delicate, slightly sweet and mildly buttery, and went beautifully with the very apparent herbal undertones of the risotto. The carrot, at the same time, contributed a great crunchy element to the dish, and I enjoyed the sweet, bright tang of the tomatoes as well. In our final savory course, top sirloin steak was cooked spot on, though it arrived at the table slightly cool. Nevertheless, the meat was still pretty delectable, and proudly conveyed a very apparent beefiness that was expertly augmented by the umami-rich taste of the nameko mushrooms. The greenery, meanwhile, provided moderating hues of herbal character to the mix. We ended with a trembling panna cotta, laced with the sweet, medicinal essence of osmanthus. It was tasty enough alone, but I found the accompanying pot powder a bit overwhelming, and the asparagus seemed out of place as well. Fortunately, the kumquats and sorbet offered enough sweetness to the dessert, adding some semblance of balance to things. Have no doubt; this was an "interesting" meal. The food actually turned out better than I'd expected, though the overall experience could've used a little work, the result of cramming too many people into a confined space I'm sure. In the end, you have to look past the hullabaloo and clamor surrounding the dinner and realize that there's some solid, tasty, honest-to-goodness cooking going on here. 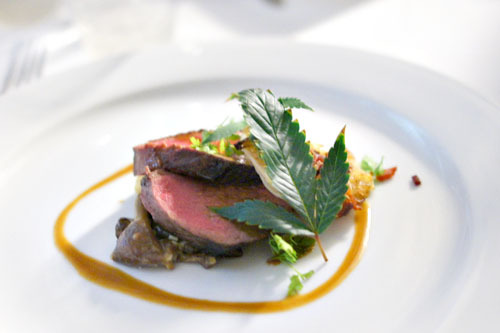 The collaboration between Laurent Quenioux and Starry Kitchen has been a fruitful one, and I'm looking forward to what they come up with next, Cannabis or not. Sounds like fun, but I think I would prefer one of LQ's other dinners. Did you ever feel the marijuana was out of place? Some of the dishes looked pretty complete without the addition. I also think James Koh and Nyguen tran could be brothers. First, PROPS to Kevin for blurring out EVERYONE'S face that he didn't have permission to publish (in this illegal dinner). I dun care whether people agree or disagree w/ his write-up, THAT takes a lot of work. Glad you could make it and enjoyed it. I will say the communal element was SUPER key. It's illegal+underground, had a DJ in a random loft space with people you have never met before.. might as well get to know each other!! You and Ryan weren't completely in the loop since you got the details SUPER late in the game so you didn't get the full experience leading up to it either. I myself do not partake, but I have a very natural predilection to any subversiveness, so I love this dinner. Strictly from a food stand-point, it looked pretty tasty. Roddy: I'll let you know when I hear of any more upcoming dinners. 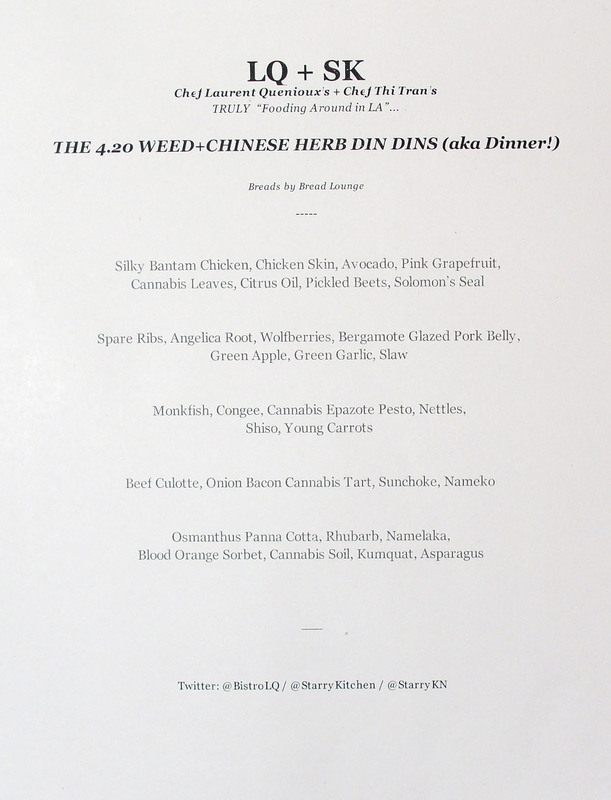 The weed wasn't out of place per se, but yes, you probably could've substituted another type of herb and the courses would still make sense. I'd say that it was most tightly integrated in the monkfish course. Nguyen: Ha! It did take some effort to select and pixelate everyone's faces. Don't know how much good it really does, since we were on TV. Thanks for the additional deets though; I was partially notified of the situation while I was driving to dinner! 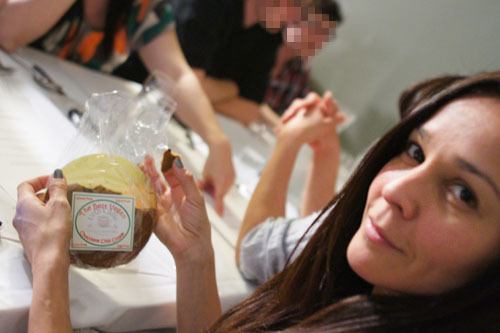 Anon: You know, I don't partake either really, but I made an exception for this dinner (Or did I? Does this even count? ).